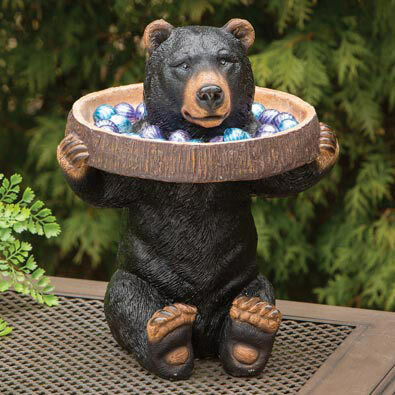 *Sorry, express shipping and gift wrapping not available for Bear Holding Tray Birdbath/Feeder Garden Sculpture. Our large bear bench is a decorative, rustic addition to your indoor or outdoor décor. The two stately black bears stand on pedestals and hold up a thick faux wooden plank for a striking resting place in your garden. An original design sculpted of durable polyresin with fiberglass reinforcement, finished with a clear weather resistant protective coating. A unique and long lasting focal point for your home. Bench measures 12" x 25¾" long and stands 14&frac58;" high. Minor assembly required. *Sorry, express shipping and gift wrapping not available for Bear Pair Bench.